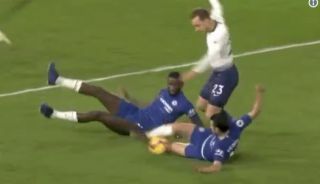 Chelsea winger Pedro had a great game against Tottenham this evening, scoring the opening goal and also producing this brilliant moment. Watch the short clip below as the Spaniard tracked back superbly to put in a strong challenge that N’Golo Kante would have been proud of. And just after that, Pedro produces some lovely footwork to bring the ball forward from defence, seeing off the challenge of two Spurs players in the process. Chelsea might not be too convincing under Maurizio Sarri this season, but in Pedro they have a true professional who always gives them a chance. Pedro Rodriguez is the epitome of what we wanted to see tonight. Led the attack, defended like a boss. What a game he had. Take a bow Pedrito!